The EU Action Plan for Forest Law Enforcement, Governance and Trade (FLEGT) (2) sets out measures that aim to combat the problem of illegal logging and the associated trade. The Action Plan proposes the development of a Forest Law Enforcement, Governance and Trade licensing scheme (hereinafter referred to as the FLEGT licensing scheme) to ensure that only legally harvested timber is imported from countries participating in the scheme. Under this scheme the Community aims to conclude Voluntary Partnership Agreements with countries and regional organisations (FLEGT partner countries). Timber products exported from FLEGT partner countries to the Community should be covered by a FLEGT licence issued by the licensing authority of that country. The FLEGT licence should demonstrate the legality of the timber products covered, as set out in the corresponding FLEGT Voluntary Partnership Agreement. Regulation (EC) 2173/2005 lays down EU procedures for the implementation of the FLEGT licensing scheme, including a requirement for imports into the Community of timber products originating in FLEGT partner countries to be covered by a FLEGT licence. In order to ensure the effectiveness of the FLEGT licensing scheme the competent authorities should verify that the timber products declared for release for free circulation into the Community are covered by a FLEGT licence. The FLEGT licence should be accepted provided that certain conditions have been fulfilled. It is therefore necessary to lay down detailed provisions relating to the conditions for the acceptance of the FLEGT licence. In order to ensure consistent treatment of FLEGT licences by the authorities in the Member States it is necessary to set out the information to be included in the licence. Furthermore it is necessary to provide for a standardised format of the FLEGT licences so as to facilitate their effective verification. Given the competitiveness of the international timber trade, the implementation of the FLEGT licensing scheme requires that the procedures concerning the release for free circulation of FLEGT licensed timber products do not lead to undue delays in importation procedures. It is therefore necessary to provide for procedures for the verification and acceptance of the FLEGT licence which are as simple and practical as possible, without however compromising the credibility of the system. The Community and the Member States have committed themselves, under the Lisbon Agenda, to increasing the competitiveness of companies doing business in Europe. Pursuant to Decision 2004/387/EC of the European Parliament and of the Council of 21 April 2004 on interoperable delivery of pan-European e-Government services to public administrations, businesses and citizens (IDABC) (3), the Commission and the Member States should provide efficient, effective and interoperable information and communication systems for the exchange of information between public administrations and Community citizens. The protection of individuals with regard to the processing of personal data is governed by Directive 95/46/EC of the European Parliament and of the Council of 24 October 1995 on the protection of individuals with regard to the processing of personal data and on the free movement of such data (4), which is fully applicable to the processing of personal data for the purposes of this Regulation, in particular as regards the processing of personal data in licences. This Regulation lays down detailed rules for the application of the system of imports of timber products provided for in Article 5 of Regulation (EC) No 2173/2005. ‘competent authority (ies)’ means the authority (ies) designated by the Member State to receive, accept and verify FLEGT licences. 1. A FLEGT licence, hereinafter referred to as ‘licence’, may be a paper-based or an electronic licence. 2. The Commission will transmit a specimen or the technical specifications of the licence drawn up by each partner country to the competent authorities and the customs authorities of each Member State. The use of a licence shall be without prejudice to any other formalities relating to the movement of goods within the Community. The competent authorities or the customs authorities of the Member State in which the shipment is declared for release for free circulation may require that the licence be translated into the official language or one of the official languages of that Member State. The corresponding costs shall be borne by the importer. 1. The licence shall be lodged with the competent authorities of the Member State in which the shipment covered by that licence is declared for release for free circulation. 2. The competent authorities referred to in paragraph 1 shall inform in accordance with the applicable national procedures the customs authorities as soon as a licence has been accepted. 4. A licence lodged before the arrival of the shipment that it covers may be accepted if the licence meets all the requirements set out in Article 7 and no further verification in accordance with Article 10(1) is deemed necessary. 5. 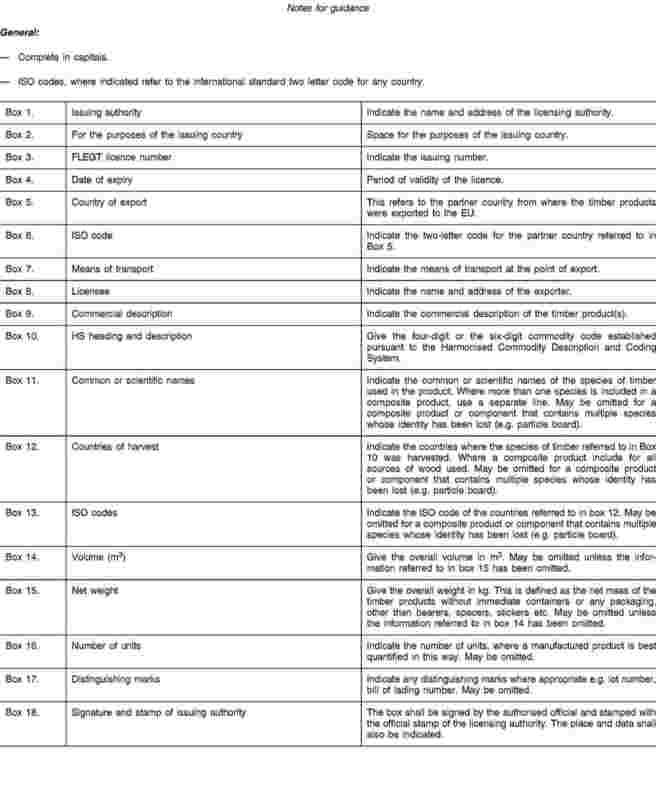 Where further verification of the licence or of the shipment is deemed necessary in accordance with Articles 9 and 10, the licence shall be accepted only after the satisfactory completion of that further verification. 1. Paper-based licences shall conform to the respective specimen of the licence. 2. Both paper-based and electronic licences shall provide the information mentioned in the Annex, in accordance with the notes for guidance set out in that Annex. 4. A licence shall not be accepted if, where necessary after the provision of additional information in accordance with Article 9 or a further investigation in accordance with Article 10, it has been established that the licence does not correspond to the shipment. In case of doubt as to whether a licence, a duplicate or a replacement licence can be accepted, the competent authorities may request additional information to the licensing authority of the partner country. A copy of the licence, the duplicate or the replacement licence in question may be forwarded together with the request. 1. 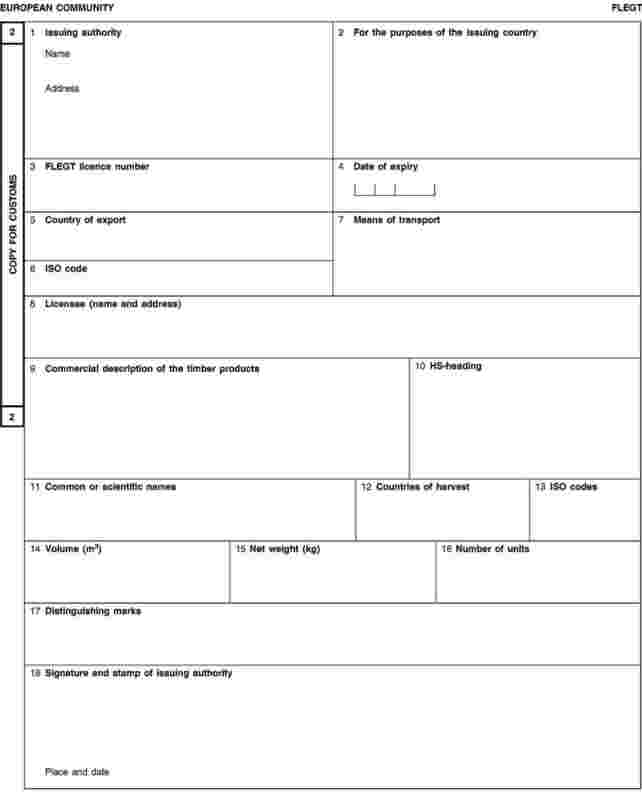 If further verification of the shipment is considered necessary before the competent authorities can decide whether a licence can be accepted, checks may be carried out to establish whether the shipment in question conforms to the information provided in the licence and where necessary to the records relating to the relevant licence which are held by the licensing authority. Where the customs declaration is made by means of a data-processing technique, the reference shall be provided in the appropriate box. 2. Timber products shall only be released for free circulation where the procedure described in Article 6(2) has been completed. Where the competent authorities are distinct from the customs authorities, the Member States may delegate specific functions of the competent authorities to the customs authorities. This delegation shall be notified to the Commission. The procedures described in this Chapter shall be carried out in coordination between the competent authorities and the customs authorities. 1. Member States may use electronic systems for the exchange and recording of data contained in licences. 2. The electronic systems referred to in paragraph 1 shall provide for the exchange of data between the competent authorities and the customs authorities of the Member States and between the competent authorities and the customs authorities on the one hand, and the Commission or the Licensing Authority of the partner countries on the other. 3. Member States shall, when establishing the electronic systems consider complementarity, compatibility and interoperability. They shall take account of guidance produced by the Commission. a means for storing data contained in licences. This Regulation leaves intact and in no way affects the level of protection of individuals with regard to the processing of personal data under the provisions of Community and national law, and in particular does not alter the obligations and rights set forth in Directive 95/46/EC. The protection of individuals with regard to the processing of personal data shall be ensured in particular with regard to any disclosure or communication of personal data in a licence. It shall apply from the date on which the first amendment to Annex I to Regulation (EC) 2173/2005 adopted pursuant to Article 10 of that Regulation applies. Done at Brussels, 17 October 2008. (1) OJ L 347, 30.12.2005, p. 1. (3) OJ L 144, 30.4.2004, p. 65. Corrected by OJ L 181, 18.5.2004, p. 25.